Mr. Democrat Congressman? 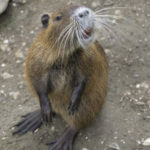 Oscar the Nutria calling. Nice talking to you. How’s the weather up in DC? Can I ask a question? Can you tell me when you’ll be back in the district for a town hall meeting or campaign event? I’m asking, because I and a few of my friends would like to attend. Y’know, we’d sure like to let you know in person how appreciative we are for your vote on Obamacare. Would you check your schedule and get back to me? Thanks. I’ll wait.